Today we’re going to share with you a totally new way of cooking a pumpkin – a super easy recipe for a pumpkin stir fry with 5 delicious spices! The spices not only create a great flavour, but also boost your digestion and bring a tonne of health benefits. It is the best recipe for Thanksgiving Day or Halloween and it’s perfect for lazy and healthy cooks. 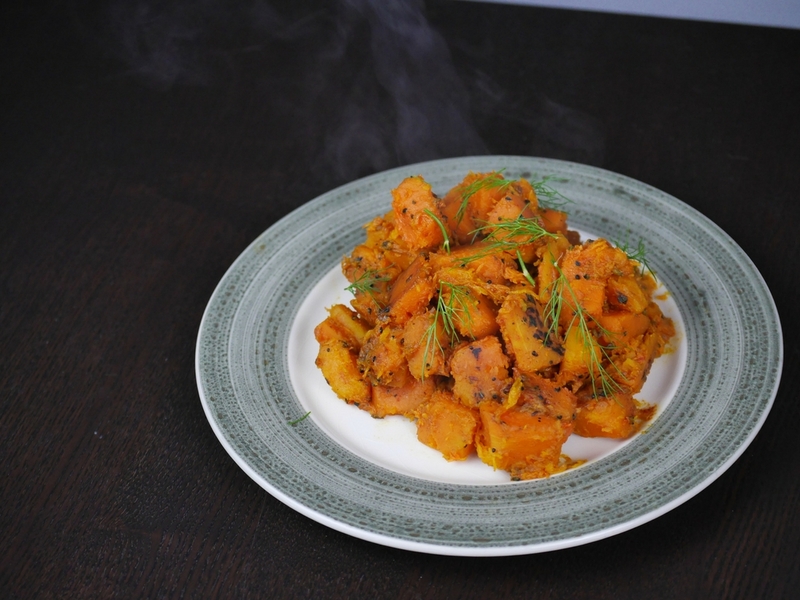 The recipe features a famous Indian blend of five spices: Panch Phoran. You can easily prepare it at home, it takes just a few minutes if you have all the necessary ingredients. Despite its simplicity, this spice blend makes a masterpiece almost of every type of vegetable. Step 1. Prepare the Panch Phoran mix. To do it you should just mix the equal quantities of 5 spices and it’s ready. You can also find it readily mixed in the shops. 1-2 tsp is usually enough for 0,5 kg of pumpkin. Step 2. Dice the pumpkin and soak it in water for 15-30 minutes. Step 3. Heat some cooking oil in a pan, add 1-2 tsp of Panch Phoran and let it cook until the aromas come out., for about a minute. Step 4. Add the pumpkin cubes (without water), mix it well to be sure that spices are evenly spread. Cover the pan and let it cook for about 15 minutes. Step 5. Add some red chilli powder (if you like it), 1 tsp of tumeric and salt. Mix it well. You can add some fresh dill or parsley for garnish or even some roasted seeds. Enjoy your pumkin with spices!